"Dell vWorkspace vs Parallels Remote Application Server"
Desktop virtualization and application publishing have made some amazing progress. There were just a few noteworthy players in the industry, but now there are quite a few different solutions that claim to do a lot of different things. 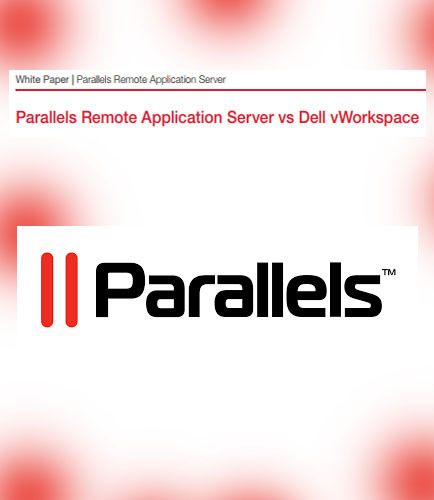 When comparing Parallels Remote Application Server and Dell vWorkspace, one can't help but notice the ease of use and licensing options are significantly simpler. Parallels Remote Application Server allows organizations to remotely install all needed components when scaling up the infrastructure. With Dell vWorkspace, organizations need to manually install the agent on every new server added after the operating system is installed, and then they have to add it to the pool of their choice. This makes the Parallels Remote Application Server easier to set up and quicker to roll out. This paper concentrates on how the features of Parallels RAS and Dell vWorkspace differ and how these differences affect the end user experience. How the features of Parallels RAS and Dell vWorkspace differ? How the differences between the Parallels RAS and Dell vWorkspace affect the end user experience? What makes Parallels Remote Application the clear choice for your business?